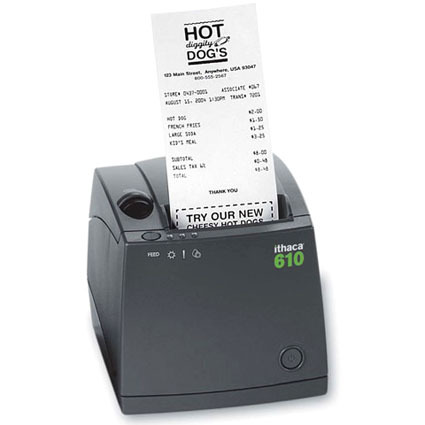 Meet the Ithaca 610 thermal printer. The footprint may be small, but the value is downright HUGE. Designed expressly for the practical day-to-day rigors of a monochrome workhorse, our Ithaca 610 delivers the goods at a price that will have you second-guessing whatever monochrome thermal you’re using now. Get ready for a 6-ips bargain that produces consistently crisp receipts with eye-catching marketing messages. The Ithaca 610 has been discontinued. A direct replacement is the Ithaca iTherm 280. Paper Thickness: 0.0025" to 0.0035"
Dimension (WxDxH): 6.25" x 8.5" x 5.87"